The army ants (Magnani) travel continuously. They use their own bodies to build their shelters. The column, composed of millions of ants, moves to 200 m per day and halted at night. The queen remains in the center and soldiers stood guard around it. 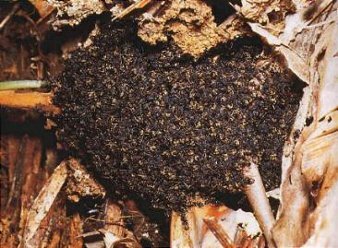 - In the center, small workers carry larvae and sometimes preys as food supplies. The queen is surrounded by its maids. - On the sides, the soldiers have a huge head and impressive jaws. Nothing can stop these ants, not even a body of water. If it is a small creek, workers are transformed into living bridge to cross the river. Otherwise, the whole colony surrounds the queen to form a floating ball until it touches the land. When they go through a village, it must be evacuated. However, before they go, villagers open the doors because ants kill rats and cockroaches. 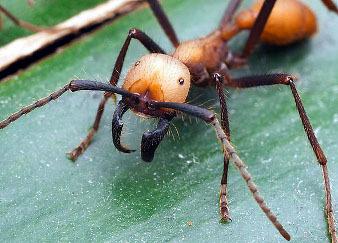 In Africa, army ants are real predators. They eat more meat than lions, hyenas or other carnivores.